Of course he forgot that whole super strength thing so the merman escapes. We also have a kind of weird colour-blind thing going on as the sheriff describes the female mermaid and doesn’t say “Asian”. Since when do police describe potential suspects without mentioning their race? There’s lots of fight scenes and the sheriff is injured. Ryn tries to reason with the mermaid which doesn’t exactly go anywhere. Xander accuses both Decker and Ben of being enthralled by the sirens which, y’know, isn’t wrong. 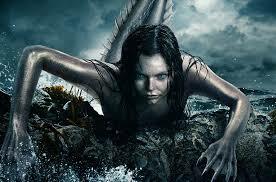 The stand off eventually ends when Ryn defeats the female mermaid and lets her live… and the merman bows to her. As Helen explains, merfolk are matriarchal and by winning the fight Ryn established herself as dominant and therefore all the fears the merfolk had about genocide no longer apply? I get the idea that she’s in charge now but it doesn’t help humanise the merfolk - especially the merfolk of colour - by having them submit to an alpha without a word of complaint like a feral pack animal rather than continue to argue their point: especially when they literally fear a reprisal of genocide. “Hey I’m afraid humans will wipe us all out but you won a fight so, yeah, we’re offski” is not the decision making of a reasoning being. But killing Ryn? That’s a simplistic good mermaid vs bad mermaid conflict. NAMELESS bad guys. She’s taken to Helen and since they can’t turn to any human medical professionals (even Ben’s weirdly corrupt doctor), they have to resort to Dekker. The man who experimented on Donna. Maddie’s also super super pissed with Ben and is looking after her injured father. While Maddie is clear that Ryn proves merfolk can “learn” to be human (aaaaargh, I’ve said this is a problem before making Ryn the “human” mermaid and the others the violent “animal” merfolk is an issue). But the Sheriff is clear - he doesn’t want them here and if it’s a choice between merfolk and the town, he’s choosing the town.